Last week the U.S. Occupational Safety and Health Administration (OSHA) issued its first detailed standard requiring employers in the construction sector to define confined spaces in their workplaces, and to implement training and safety programs to protect employees. This new standard incorporates longstanding requirements for most employers (what OSHA calls “General Industry”), with enhancements based on ongoing experience. Whether your organization is in construction, general industry, or another specialized sector, OSHA’s new standard provides a reminder to consider confined space safety in your workplaces. The following discussion summarizes the main issues and associated compliance requirements. What Are Confined Spaces and Which Require Onsite Permits? Is large enough and so configured that an employee can bodily enter [and perform assigned work]. Bins; boilers; pits (such as elevator, escalator, pump, valve or other equipment); manholes (such as sewer, storm drain, electrical, communication, or other utility); tanks (such as fuel, chemical, water, or other liquid, solid or gas); incinerators; scrubbers; concrete pier columns; sewers; transformer vaults; heating, ventilation, and air-conditioning (HVAC) ducts; storm drains; water mains; precast concrete and other pre-formed manhole units; drilled shafts; enclosed beams; vessels; digesters; lift stations; cesspools; silos; air receivers; sludge gates; air preheaters; step up transformers; turbines; chillers; bag houses; and/or mixers/reactors. Hazardous atmospheres can arise in spaces with fuel-fired machinery, or low-lying spaces into which carbon dioxide or other heavier gases may flow and concentrate. Dangerous configurations include large storage bins and material-feeding mechanisms. Have Potentially Hazardous Spaces Been Identified and Characterized? A material that has the potential for “engulfing,” including liquids or fine solids, or something that can exert enough force on a worker’s body to cause strangulation, constriction, or crushing. Physical hazards such as heat or cold, noise, vibration, radiation. General hazards such as slippery or rough surfaces, snags, scaffolding, material piles that could collapse, etc. Mechanical or electrical equipment that, when running, could cause injury. Electrical equipment or circuitry that could cause shocks or sparks. Pipes or valves that could open or leak, releasing materials into the workspace. Communication limitations between employees inside the space and those outside. Employee fatigue when working in the space. The employer should consider whether hazards can be reduced or managed sufficiently to render a space non-hazardous, or at least to reduce hazards sufficiently so a space is not permit-required. For example, ventilation might address atmospheric hazards, and improved electrical equipment or a lockout-tagout program may address electrical hazards. 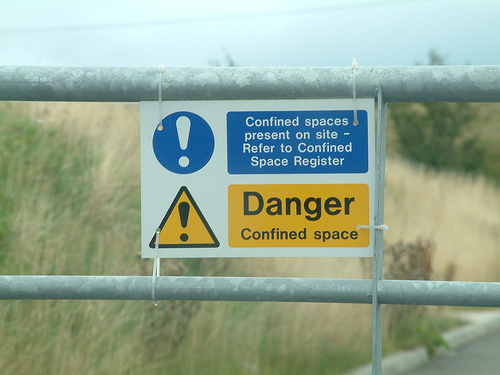 What Compliance Requirements Apply For Permit-Required Confined Spaces? Prohibit employee entry except when following permit procedures (see below)—this includes formal policy prohibiting entry, signs or placards to identify prohibited spaces, appropriate information and training, and physical barriers (such as keeping doors locked). Inform employees of the location and hazards of permit-required confined spaces. Additional permits, such as for hot work (welding, etc. ), issued to authorize the work. OSHA’s Construction Standard becomes effective on August 3, 2015. The General Industry Standard was last revised in 1999. Has the organization evaluated its facilities and worksites to identify any confined spaces? Has the organization performed hazard assessments for all confined spaces to determine the type and extent of hazards? Has the organization defined any confined spaces where hazards risk death or serious injury as “permit-required confined spaces? If any facility or worksite contains a permit-required confined space, has the organization established and implemented a written program that meets OSHA requirements?